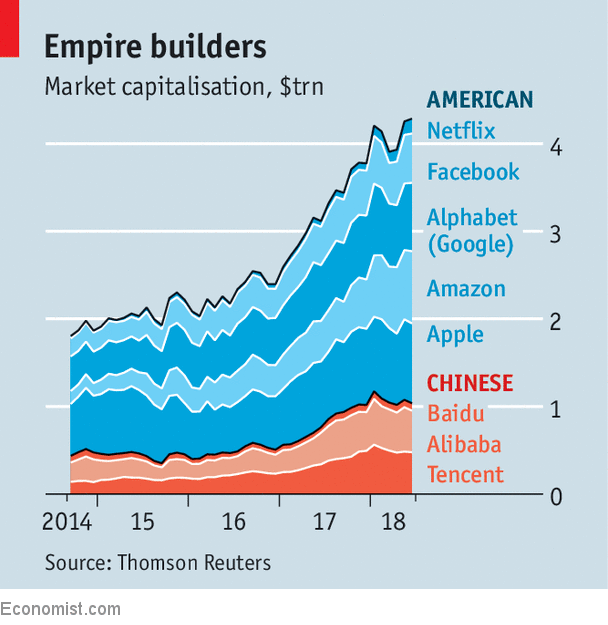 The geopolitics of business means that the world’s biggest tech firms have swelled to combined market capitalisations of over $4trn without really going head to head. 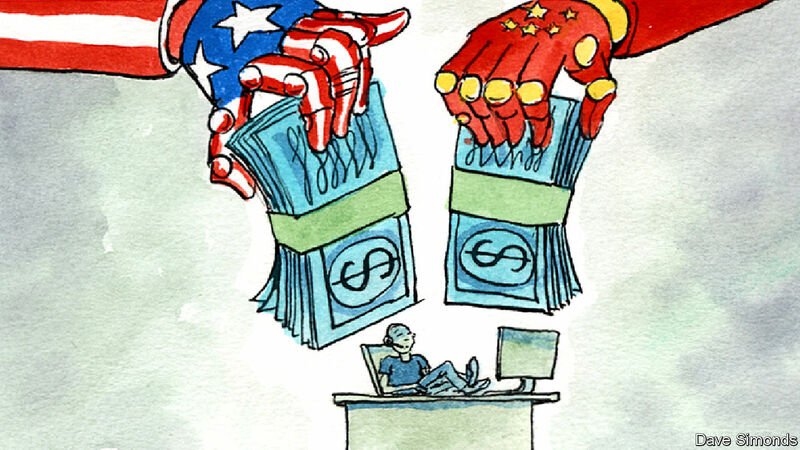 China blocked Google et al with its Great Firewall, preventing American firms (Apple is an obvious exception) from taking on Chinese rivals on the mainland. Chinese giants have stayed out of America; Europe fell under the spell of Silicon Valley before Chinese tech had matured. They have very different strategies, however. American firms typically set up outposts from scratch. They fund subsidiaries that offer much the same service to Indians or Mexicans as their domestic users might expect. Amazon’s foray into India, for example, involved it pledging over $5bn to broadly replicate its American offering. It has built a network of warehouses to fulfil e-commerce orders, rolled out its Prime video service (with added Bollywood content), website-hosting services and so on. It rebrands acquisitions. Last year it paid $650m for Souq.com, an e-commerce website based in Dubai, now clearly marked as “an Amazon company”. Tencent has similarly ploughed money into a clutch of Indian firms in areas as diverse as ride-hailing, online education, music-streaming, health care, IT and e-commerce, as well as Nigerian payments and Indonesian logistics. (Baidu is the least active thus far in building its emerging-market presence, but its heavy investment in artificial intelligence could result in its technology being used globally in self-driving cars, for example.) According to CBInsights, a data firm, Tencent, Alibaba and its Ant Financial affiliate have backed 43% of all Asian “unicorns”, meaning startups worth more than $1bn. Alibaba’s investment in Lazada, South-East Asia’s largest e-commerce platform, has soaked up $4bn. Jack Ma, Alibaba’s founder and boss, has pledged $8bn to India alone. How are these differing strategies panning out on the ground? The most intense Sino-American rivalry thus far is focused on India and South-East Asia. The scale of investment reflects the stakes: Indian start-ups received $5.2bn in Chinese tech money last year, according to Tracxn, a data provider, up from $930m in 2016. Forrester, a market-research group, says that Chinese tech giants (including Didi and JD.com) spent $6bn on acquisitions in South-East Asia in 2017. Global heft counts for something in local battles. Services such as Amazon’s movie-streaming offering can be rolled out from one country to the next, as can its relationships with global suppliers. That has made it cheaper to set up foreign outposts than to acquire them. Amazon has probably spent about $3.5bn to date building its Indian operation, where it is largely on a par in terms of market share with Flipkart, a local e-commerce site which has raised nearly double that in equity and debt. The two models could yet both be proved right, and start to converge. The advantages of being part of a global outfit might be decisive in delivering some services, such as search or social media. Alibaba is pushing its own branded B2B platform for Indian small businesses, helping them sell their wares abroad and, in this instance, expanding in much the same way that an American rival might have done. In other areas, where local nous matters more, American groups might adopt a more Chinese-style approach of building an “ecosystem” of allied firms. Amazon was said to be interested in buying Flipkart, in which Walmart is now buying a majority stake (in part from Tencent); Google is still said to be mulling a minority investment. On June 17th Google invested $550m in JD.com, a Chinese e-commerce firm which has spent lavishly on startups in Indonesia, Thailand and Vietnam. User numbers for services that are free of charge in emerging markets are inevitably mind-boggling—eight of the ten countries with the largest number of Facebook users are emerging markets, led by India with 270m. Whether that will translate into a commensurate level of revenue and profits is less clear. For all the excitement around Indian e-commerce, say, only about $27bn-worth of stuff is shifted online in India each year—about what all Chinese e-commerce firms sell in just nine days and American ones in three weeks. South-East Asia is smaller still. ← Where Did the Radical Right Come From?